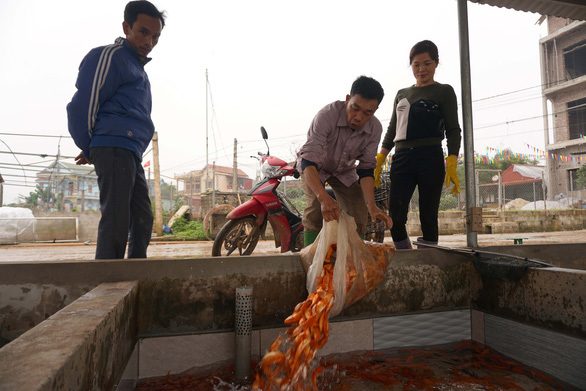 A village popular for raising red carp in northern Vietnam has entered its busiest season of the year as the type of fish is considered a fundamental part of an annual traditional ritual held to bid farewell to the Kitchen Gods. The Thuy Tram Village, located in Cam Khe District, Phu Tho Province has become quite bustling, with many cars and motorbikes entering and exiting the place to transport the locality’s famous red carp. In Vietnam, the Lunar New Year (Tet) celebration often begins with the ‘Ong Tao’ (Kitchen Gods) ceremony on the 23rd day of the last month in the lunar year, which falls on January 28 this year. Legend has it that the gods ride a common carp to heaven on this day in order to report to the heavenly emperor any of the family’s problems or deeds, good or bad, from the current lunar year. 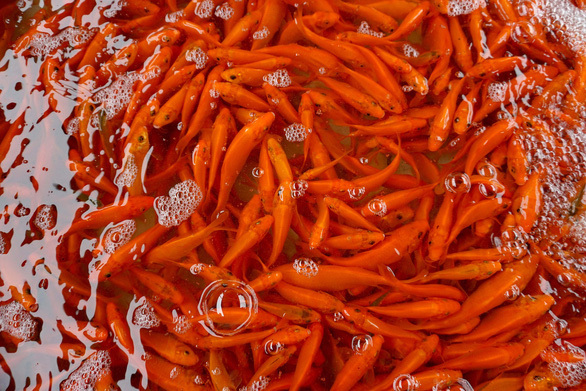 As part of the ritual, people often release carp to a local lake or river and prepare a variety of dishes, either sweet or savory, to say goodbye to the gods. 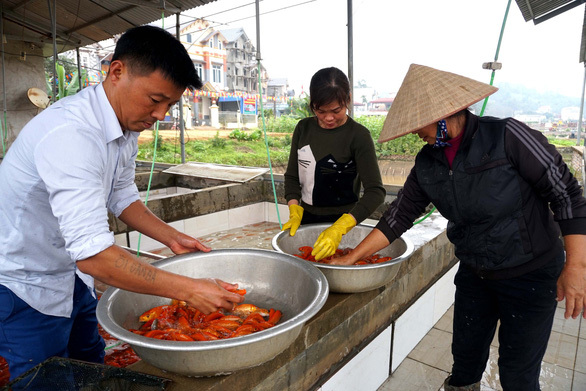 According to Bui Van Chu, director of the Thuy Tram red carp cooperative, about 250 households in the village are raising the fish, with a total area of 30 hectares. 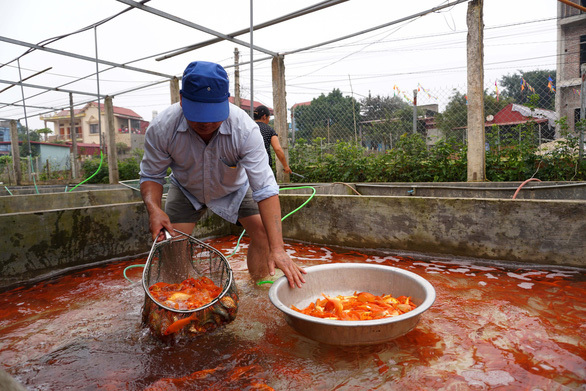 About 40 metric tons of carp are expected to be harvested this year, Chu continued. 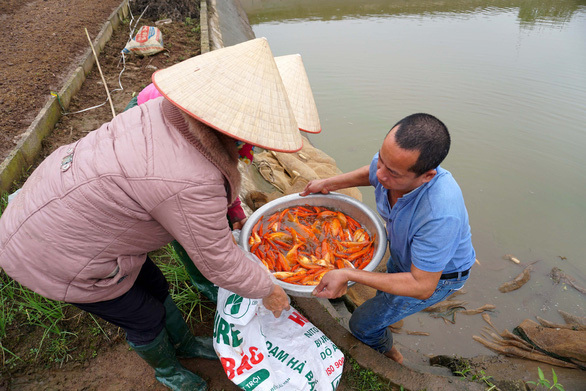 Local farmers begin raising their carp every June, Nguyen Thi Minh, a local resident, said, adding that the fish are as big as three fingers but their reddish color is very bright and vibrant. 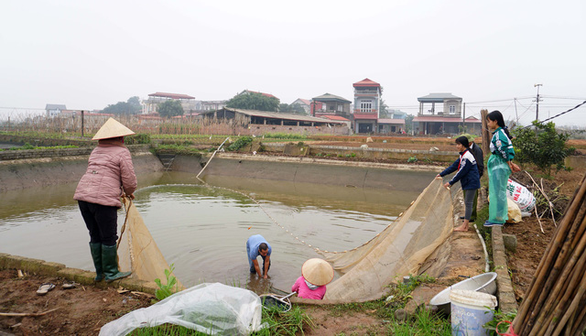 Minh runs a carp farm at her home, while each of her two sons also has their own farms. 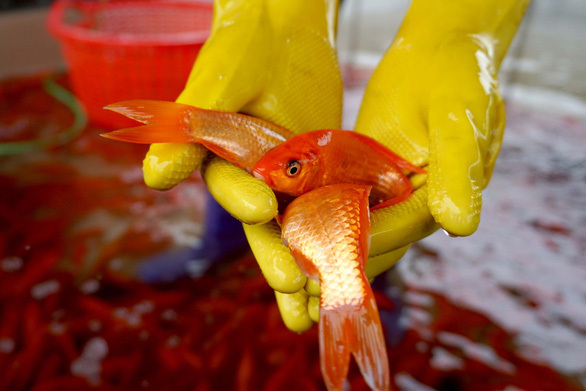 “The fish sell at approximately VND100,000 [US$4.3] per kilogram.  I will earn about VND40 million [$1,720] worth of profit after all of them are sold,” she added. 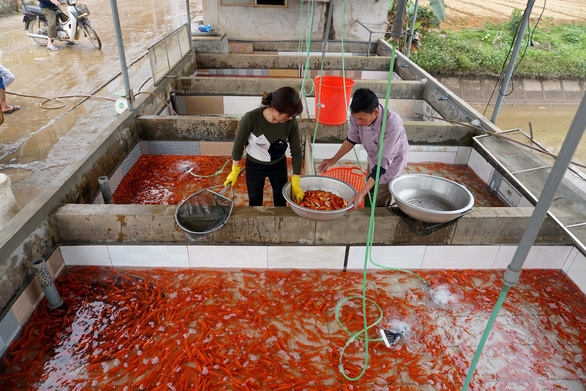 Meanwhile, Tran Van Tiep, said he can pocket up VND200 million ($8,600) every year after selling three to four metric tons of carp. Regular buyers of Thuy Tram Village are merchants from nearby provinces, namely Tuyen Quang, Yen Bai, Lang Son, Lao Cai, Vinh Phuc, and others. 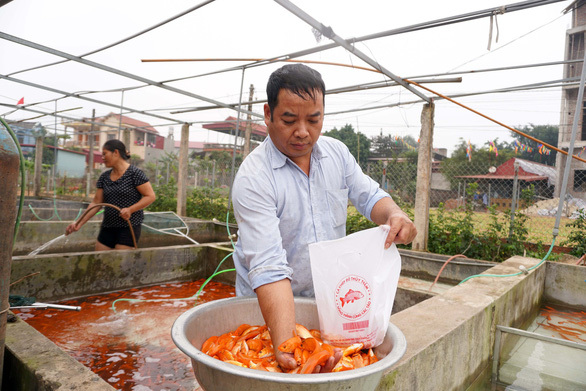 According to Nguyen Tien Minh, a merchant from Vinh Phuc, red carp are highly preferred compared to other types of carp thanks to their beautiful color. Minh added he often buys one to two metric tons of the fish in Thuy Tram Village each year and resells them to people in his hometown.